The Chicago Park District includes more than 7,600 acres of parkland, 570 parks, 31 beaches, 10 museums, 2 world-class conservatories, 17 historic lagoons and 10 bird and wildlife gardens. Seventeen therapeutic recreation sites serve individuals with disabilities throughout the city. In addition, 15 beaches now have beach mats to provide an accessible path of travel through the sand, 8 indoor city pools have pool lifts and one outdoor pool has a ramp. There's even a fully accessible softball field, sponsored by Wrigley Field. For further details, call the Disability Policy Office at 312-742-5097. The Rehabilitation Institute of Chicago's Wirtz Sports Program offers 20 different sports and recreational activities: wheelchair softball, aerobics, strength and conditioning, track and road racing, field events, power-lifting, skiing, sitting volleyball, fencing, golf and outdoor education programs. Programs are free of charge to all participants. Located in Lincoln Park, the driving range is open year-round with covered, heated stalls large enough to accommodate a scooter or wheelchair. An adaptive golf cart with swing out chair can be used on the grassy area next to the last stall. The miniature golf course is paved and has movable borders to accommodate wheelchairs. Park restrooms with accessible stalls are located nearby. The adjacent parking lot has 5 designated accessible spaces. Run in partnership with the Chicago Parks District, this summer sailing program provides classroom and on-water instruction for people with physical and sensory disabilities, ages 8 and up. JGSAP also has an active racing program. Specially constructed boats, boarding ramps and other equipment ensure the safety and comfort of JGASP sailors. Accessible parking and restrooms are adjacent to the dock area. The office is open Wed-Sun, 9am-5pm. This bike center in Millennium Park has hand cycles and tandems for rent. They also offer tours of the lakefront and nearby neighborhoods lasting 2 to 4 hours. Members have access to free, secure bike parking and accessible roll-in showers, toilets and lockers. Day passes are available. Hours vary by season. A popular place to hang out with friends of all abilities, this bowling alley/lounge is fully accessible. It even has adaptive aids including a push rack and mechanical bumpers. Open Sun-Thurs, noon-1am, Fri-Sat, noon-2am. This non-profit organization provides progressive sports and recreation opportunities for people with physical disabilities and their families. 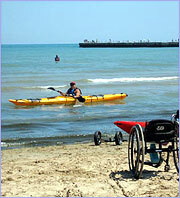 A variety of sports and adventure programs is available in every season, both in the Chicago area and further afield. The Northern Suburban Special Recreation Association (NSSRA) is an intergovernmental partnership of ten park districts, two cities and one village in the northern suburban area of Chicago. NSSRA provides and facilitates year-round recreation programs and services for children and adults with disabilities who live in the partner communities.